When is the best time to pursue a new educational opportunity? Some say during a recession is a great time to give yourself a competitive advantage. The University of the West Indies’ (UWI) newest initiative, the Open Campus, with its mixed mode delivery which includes internet teaching may well be the opportunity for the Caribbean and its Diaspora to retool or get a new tool as the case may be. Officially launched last July during the Caribbean Community (CARICOM) heads of government meeting in Antigua, the Open Campus represents a sort of technological coming of age for the regional university that has had to fight with the demon of distance – delivering service since its founding in 1948, to a community dispersed over the Caribbean Sea. Vice Chancellor of the UWI, Professor E. Nigel Harris, who formally launched the Open Campus during an official news conference with the international, regional and local media, stated that the university deliberately chose that moment to announce this initiative when the heads of government of the Caribbean were gathered, to reiterate the University’s continued dynamic response to broaden and enhance the reach of the institution to the people of the Caribbean. And the campus is in demand. Dr. Roger Powley, Acting Director of the Campus’s Academic Programming and Delivery Division (APAD), now Consultant, Special Projects, revealed that in Semester I of the 2008/2009 academic year, the Open Campus had received 10,948 applications online as of September 9th. The current enrolment for Associate of Science students (face-to-face) and other online students is now 8,637. 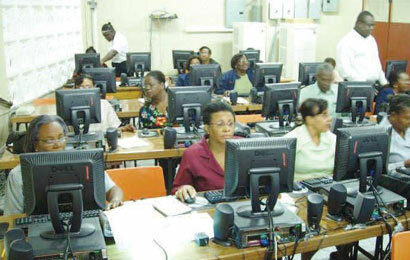 The UWI says 123 courses and 38 programmes are being offered by the Open Campus in the first semester. “…The UWI is about to take another giant step in its service to its region,” said Prof. Lawrence Carrington, retired Director of the School of Continuing Studies and Pro-Vice Chancellor writing in “Breaking Down the Walls” a brief history of the School, which is leading the Open Campus initiative. The UWI’s Open Campus is an amalgamation of the previous Office of the Board for Non-Campus Countries and Distance Education (BNNCDE), the School of Continuing Studies (SCS), the UWI Distance Education Centre (UWIDEC), and the Tertiary Level Institutions Unit (TLIU). She explained that the Open Campus has the same level of autonomy as other UWI campuses with its own academic board, financial management, registry, administrative and student support systems. When the Open Campus staff met at a recent retreat in Belize, they articulated their vision for the initiative. They expect that by 2020, the UWI Open Campus will be the ultimate choice for human development enabling the UWI to be a highly ranked, internationally accredited premier institution, in the top 10 for open and distance learning, contributing to positive transformation of Caribbean people and society by enabling social, economic, political, regional integration and overall well-being. The Open Campus began to offer its services across the region on August 1, 2008 to coincide with the year-long celebrations of the 60th anniversary of the UWI. The Chairman of the Open Campus Council is the Governor of the Eastern Caribbean Central Bank, Sir K. Dwight Venner. At the Opening ceremony (l-r) Chancellor of the University, Sir George Alleyne, Pro-Vice Chancellor and Principal of the Open Campus, Professor Hazel Simmons-McDonald, Professor E. Nigel Harris, Vice-Chancellor of the UWI and Chairman of the Open Campus Councuil, Sir, K. Dwight Venner.